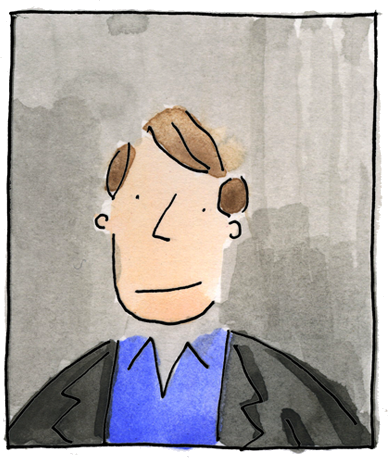 Marketers are full of buzzwords, particularly when talking about innovation. Even the term “innovation” is a cliché in danger of losing its meaning. In talking about innovation, it’s easy to get lost in the “strategery” and lose sight of the actual consumer need. 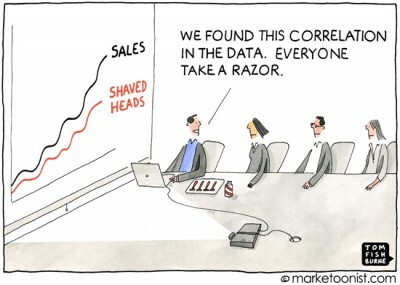 We marketers tend to breathe our own exhaust after a while. One of the more misunderstood and overused terms in innovation is “disruptive”. Contrary to how its commonly used, “disruptive” is not just another way of saying “really really innovative”. “Disruptive innovation” is a specific term coined by HBS Professor Clayton Christensen that refers to an innovation that overtakes an existing market by applying a different set of values and creates a completely new market. Digital photography was a disruptive innovation that overtook chemical photography. Wikipedia was a disruptive innovation that overtook traditional encyclopedias. Very few innovations are truly disruptive. Yet rare is the innovation that doesn’t get pitched as “disruptive”. All this ‘management speak’ is just a manager trying to be ‘disruptive’ in this meeting. Even better than your last one, Tom! Superb, and all-too-true. What a lot of people don’t seem to get is that if an innovation is disruptive, then by definition the business model is fundamentally altered. Few large companies are willing to undergo this kind of cannibalism. Everybody wants to be a startup, which is fairly insane considering that startups are a bad business model – most of them fail. I might owe people an explanation. Startups do disruptive innovations. They don’t do it because it is inherently better. They do it because it is the only way for a tiny company to compete with larger, most established firms. Tom, I like your point about losing sight of a consumer’s need. In reality, truly disruptive products and/or services aren’t created with the intent of being disruptive. Consumer acceptance of an “evolved” solution (sometimes to an unknown problem – think Netflix and Amazon) is what makes it disruptive. 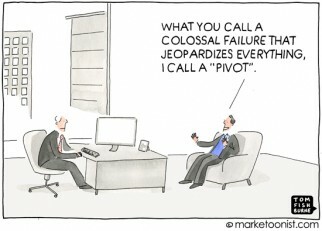 Most uses of the term ‘disruptive innovation’ are more marketing fashion statement than reality. And most of today’s software superpowers delivered ‘non-disruptive’ innovation to their partners during their startup phase. When Microsoft the startup did a deal with IBM to provide it an OS for the original IBM PC–it was symbiotic, not disruptive. When Google the startup embedded its searchbox on the Yahoo home page it was symbiotic, not disruptive. 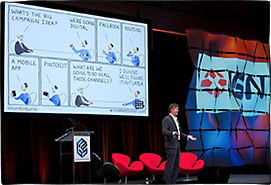 When Adobe the startup provided its Postscript engine to Apple for inclusion in the original Apple Laserwriter, it was symbiotic, not disruptive. When you let VC bankers and me-too marketers run your startup, they will ‘disruption-wash’ you every time—which is why people tune in to see HBO’s ‘Silicon Valley’. “Losing sight of a consumer need” reminds me of Prilosec’s relatively new berry flavored tablet. It was apparently launched to provide a better experience (another overused marketing term) to the bad taste of the tablet even though it’s only on the tongue for a second before you take it with water. The packaging makes sure to note that one shouldn’t chew it since it’s not a chewable tablet which would have made sense. The Larry the Cable Guy ad positioned it as something you didn’t think you needed – that’s all they could say about it. How’s that for marketing an innovation?! The invention of ‘Apps’ by Mr. Steve Jobs was disruptive to the search model founded by Google. An innovation can only be disruptive after coming to market; its difficult or almost impossible to pre-empt it. Hey Tom, great cartoon as usual. 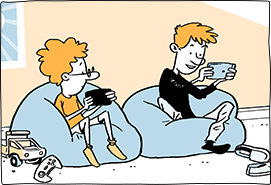 While I do get this cartoon is all a dig on buzzwords, true disruptive innovation (ie technology driven) is unfamiliar with users because people have no prior experience (or context) on how to use it or what to think about it. 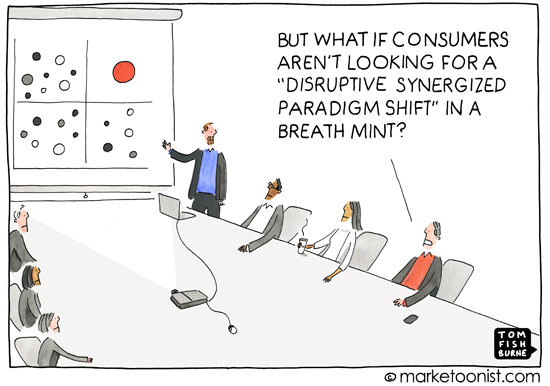 So yes, with disruptive innovation consumers are not looking for a “disruptive synergized paradigm” shift in a breath mint, cos people don’t know what they don’t know. But this does not mean it should not be done. Heck, a Marketer should know just to re-brand the pill and make it distributable to all by putting the “Marketing Touch” on it. Then, show why it’s needed and what ALL the benefits will be if we take it. Make sure that the production and distribution and post-sales lines are ready, and so on… If it needs re-branding, then so be it. Innovation is necessary for growth, regardless of it’s inanity to some. We used to make silly movies about going to the moon, never believing it would ever be possible. I was always taught that “brainstorming” was basically either a group of people or just one person “…throwing ideas onto the table, no matter HOW ridiculous it seemed”. Then, looking at the “table”, and after ruling out the ones like the cartoon above, you start to look for the GOOD ideas. When you sift through THAT pile, it’s where you start seeing “Innovation”. I find it amazing how often the focus on marketing excludes insight on the real customer needs. At the end of the day, without need, you got nothing!